Wins, on Christmas, against potential playoff rivals, tend to seem more meaningful then they usually are. 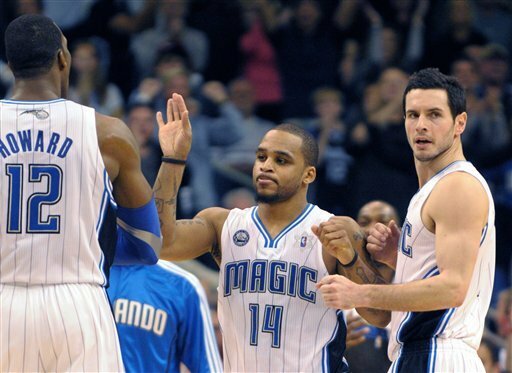 Still, the Magic (18-12) beating the Celtics (23-5) 86-78 after being behind most of the game and playing without Dwight Howard (6 points, only 4 attempts from the field) for a long stretch says something about the new and revised Orlando Magic. It says something about their toughness. It said something about Stan Van Gundy, who yelled at his guys to keep on fighting, stay focused and not let up. It kept them in the game despite Howard having an awful game until he woke up in the fourth quarter. Van Gundy knew, I guess, that Nelson (5 points) can’t be that horrible for an entire game. He knew that Howard will eventually find himself through defense, which he did (5 blocked shots, 11 rebounds), getting his first field goal of the game midway through the fourth quarter. 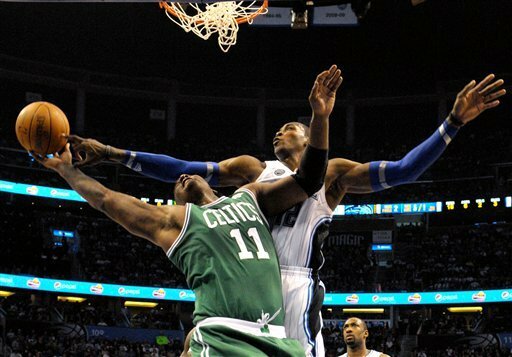 More than everything, this win was a lot more important to the Magic than to the Celtics, who were coming off 14 consecutive of those. They frustrated Orlando and especially Howard for three quarters, playing perfect defense while Pierce had a huge first half but fizzled in the fourth, with Orlando’s D, keeping in the game all night long, finally got Howard, who was just swatting and changing about every shot in the final 5 minutes. Garnett was great, finishing with 22 points, but the help around him dwindled as the minutes flew by. Allen was a no show (9 points, 3-12 from the field), Shaq fouled out after he did a great job on Howard, committing six in 13 minutes. Every ounce of energy was left in the team effort to stop Howard, and Shaq scored just 2 points and grabbed one rebound. No Rondo, especially in the finishing moments, was the real killer. Nate Robinson had an embarrassing 2-14 from the field and didn’t do the defensive job Rondo would have done on Nelson in the clutch. Two more things, well actually one more thing on two players – Hedo and Bass. Turkoglu, who the Magic got back last week (why the hell did he leave?) finished with 16 points and some uncharacteristic defense in the final moments including a big block/strip inside the last three minutes. Bass finished with 21 points and 9 boards, making us forget that the Magic don’t really have any real presence in the paint besides Howard, which if not dealt with, will become a problem in those crucial games in April and later on. The Celtics, without Rondo, played the right basketball, however “ugly”, and lost this game only because a super effot from Howard on D in the final moments and Nelson/Reddick making shots I’m not sure they’ll make very often. You can’t win them all, and after 14 consecutive wins, the energy just isn’t there every time. These kind of losses are OK when it’s December. It was a nice preview for the main dish from LA, with an ‘ugly’ game that was fun to watch, especially if you like great defense and two teams shooting under 40% from the field. Still, I agree with LeBron, Van Gundy and Jackson. No one should be playing on Christmas. Another day of rest won’t do anyone any harm.